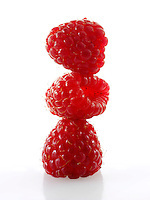 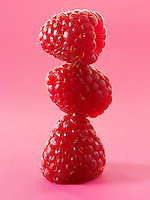 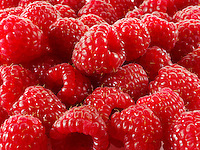 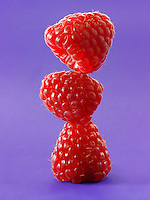 Fresh raspberries fruit food pictures, photos & images. 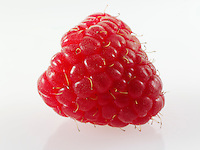 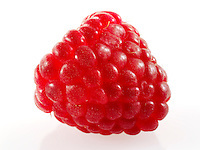 The raspberry is the edible fruit of a multitude of plant species in the genus Rubus, most of which are in the subgenus Idaeobatus; the name also applies to these plants themselves. 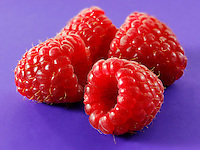 Raspberries are perennial. 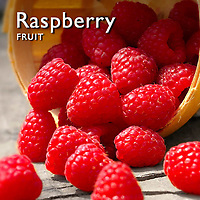 The name originally referred to the European species Rubus idaeus (with red fruit), and is still used as its standard English name. 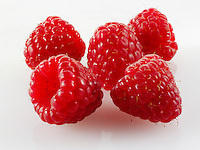 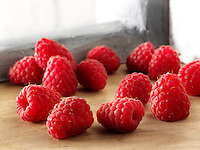 Raspberries are a rich source of the flavonoids quercetin and gallic acid, which have been shown to play a role in heart health and the prevention of cardiovascular diseases, obesity and age-related decline. 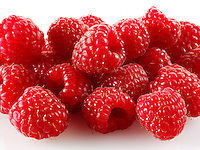 Raspberry ketones are similar to capsacin, found in red pepper, which is known for its ability to inhibit the growth of cancer cells.